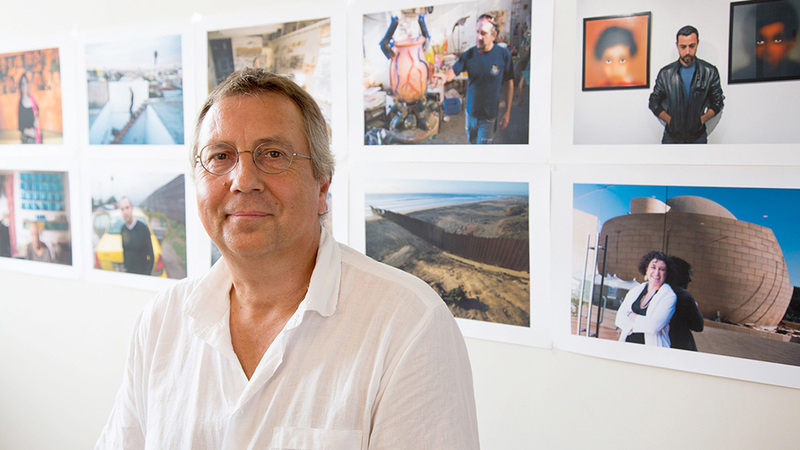 Editor’s Note: I am happy to introduce Stefan Falke,a professional photographer who has done fascinating work along the U.S.-Mexican border. He agreed to an interview and to share some of his pictures with SDFP. Thank you Stefan! 1. So Stefan, tell us where you were born and raised? Where do you live now? I was born and raised in Paderborn, Germany. I moved around Germany a lot after finishing high school. I am living in New York City now. 2. How did you get interested in photography and how long have you been a professional photographer? I was drawing cartoons obsessively until my father gave me a camera when I was 14. I have not stopped taking pictures ever since. I have always called myself a photographer even when I did not make money with it. I am fully living from photography for about 20 years now. I am 59. My ‘career’ jump started in the mid-1990s when a good friend of mine who became a well known director in Germany asked me to shoot the stills for one of her movies. I have shot stills for about 20 movies since. 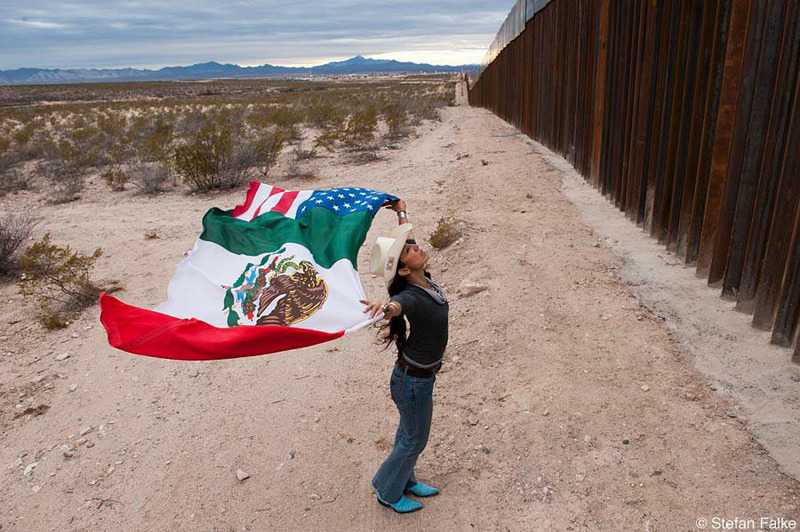 American photographer, peace activist and educator Raechel Running at the border fence near Agua Prieta, Mexico, where she continuously works with a local community. 3. How did you become interested in the U.S.-Mexico border? I grew up with a border dividing my own country between East and West Germany (I grew up in West Germany). I was living in New York already when news about the violence from the US-Mexico border made it to the front pages of our newspapers on a regular basis. That was 2006 and 2007. I had been to many places in Mexico as a tourist, Yukatan, Mexico City, Acapulco, Chiapas … but never anywhere near the border. Up to that point I was afraid of it (the border) like most people were and still are. I didn’t doubt the terrible news, but I was interested in seeing for myself how people lived with the violence and especially, what it meant for the artists and their work. I was not interested in photographing the violence like most photographers who went there, but to focus on cultural activities. My strong belief is that if we don’t show the arts and culture of troubled places we will stop caring about them after a long period of continuous bad news. There are many examples of such unfortunate places in the world. I finally went to Tijuana in 2008 and met with a lot of amazing artists who just kept working on their art although many had very bad personal experiences or knew people with horrific personal stories. Encouraged by the energy and hope of those artists I started my project LA FRONTERA: Artists along the US Mexico Border. First only in Tijuana. 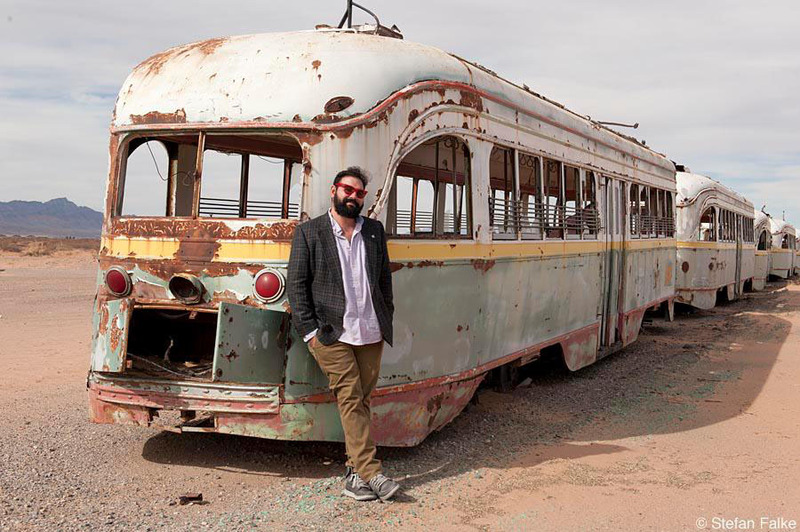 Photographer (recently turned politician) Peter Svarzbein at the trolley depot in the desert near the airport of El Paso, Texas. 4. Tells us a little bit about your journey through the border. Where along the border have you been and which part was the most dramatic? There wasn’t really any dramatic part and if, it was only in my head. I was pretty paranoid during my first visits, but I wasn’t in any immediate danger at any time. Also, my safety was thanks to the many helping artists who would guide and protect me. They usually knew what to do and what not to do, where to go and where not to go. To coordinate the many meetings and studio visits was a challenge but I had so many kind people (most of them friends now) who helped me in every city I visited. They where very surprised to see a photographer working on a cultural, positive story on the border while the international media seemed to be only interested in stories about the violence. In the beginning, I kept going back to Tijuana because it was (and still is) for me a most fascinating city with a very active art scene. I went back three times until I ran out of money, so I stopped working on the idea for a year or two. It was always on my mind though. Luckily there was already a big interest in my project and I was invited to show my work at the art-center Casa Del Tunel in Tijuana in 2012. I decided then that it was time to bring the project to the next level and to travel the entire border. A grant from a German photography foundation and my own online fundraiser made that possible. At first I branched out to Tecate and Mexicali, and then I flew all the way east to Brownsville and Matamoros and traveled west from there. It took about three more trips (3 weeks each) to cover most cities along the entire 2000 miles of the border. There are some places where I haven’t been yet, or I did not have enough time to work, and I am hoping to fill in the gaps soon, provided I find the funding. The project is ongoing. So far I have photographed 180 artists and art supporters (museum directors, art critics, tv hosts, etc.) mostly on the Mexican side of the border in Matamoros, Reynosa, Nuevo Laredo, Ciudad Juarez, Aqua Prieta, Nogales, Mexicali, Tecate, Tijuana; and some on the US side in San Diego, El Paso, McAllen, Harlingen and Brownsville. 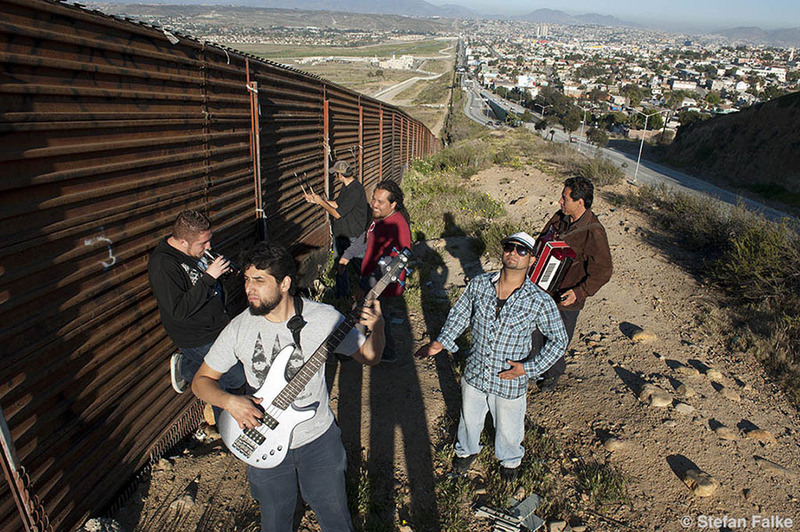 Cañamo, the Tijuana based Reggae and Ska band, at the border fence. 5. How did you find the artists to photograph? I researched just a few artists online before I would visit a particular city. I would then contact them, explain my project and in literally all cases they would participate and there was usually an artist or two who would meet me at the border and then guide me through my first few days. I would ask them for their favorite artists, and then make the contact and visit them. And repeat. The support was amazing, everywhere. I did not want to know too much about potential individuals for my project before I got to a place. The project works best when I ask around for local artists while there, and visit art institutions and museums and meet with the directors; they are great resources. I like to find the unknown and unexpected. If I do too much research beforehand, the danger is that I will judge an artist’s art and then decide if I want to photograph her or him. The project isn’t about that, not about me liking and choosing anybody, it is about the artists and their often positive influence on their community and less about the art itself. I like to think about it as more of a humanitarian project than an art project. 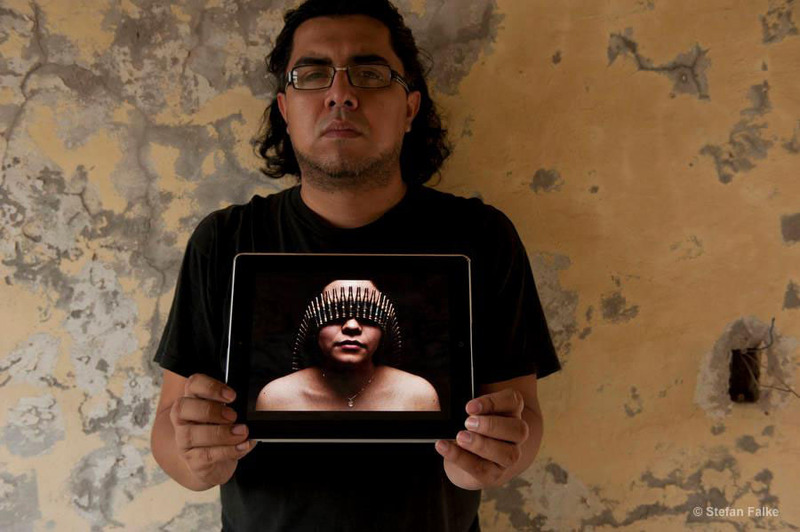 Photographer Tochirock Gallegos on the roof of his studio in Reynosa, Mexico. His strong personal work reflects the often violent circumstances in border cities like Reynosa. 6. What is your most memorable photograph? One memorable photograph is certainly that of photographer Raechel Running with the Mexican/American flag. It has become the leading photograph of the project. It wasn’t planned at all, although it might look as if it was. We were shooting pictures along the border fence in and near Aqua Prieta, Mexico, for hours already before she pulled out the double flag from her car. The light was beautiful, near sunset, the area very eerie, and I just love the resulting picture. We shot hundreds of photos out there, it was pretty mesmerizing. I like to surprise myself with my pictures. I don’t want to know in the morning what kind of photos I will produce during the day. I need to be excited about them as if they were somebody else’s. They have to be ‘news’ to me. It’s all about the moment and the collaboration between the subject and myself. Very often I cannot even communicate well because my Spanish is very poor (I am embarrassed to say). An artist once said to me: You don’t need to speak Spanish, your pictures speak Spanish. I like that. Jellyfish Colectivo a collaboration of 4 artists in Ciudad Juarez, Mexico, in front of their mural in Plaza Cervantina. 7. Who was your favorite artist? All of them, seriously !!! I am most amazed by the many young artists I met who love living wherever they live, even in troubled places, and instead of moving away (to the US, which some could) they rather stay and help improve things around them. Their art is usually very public and highly visible, like the great murals of the young artist group Jellyfish Colectivo in Ciudad Juarez. To name just one group. 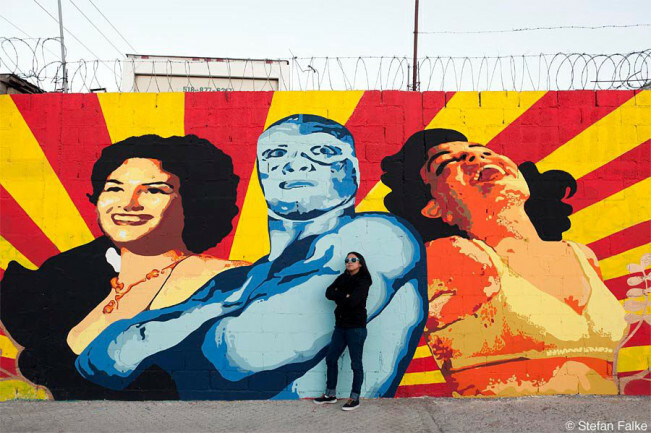 Ana Maria Cruz alias Ana Formismo in front of her mural in Ciudad Juarez, Mexico. Siki Carpio, front woman and founder of the band Cristina Crème, in her house in Tijuana, Mexico. 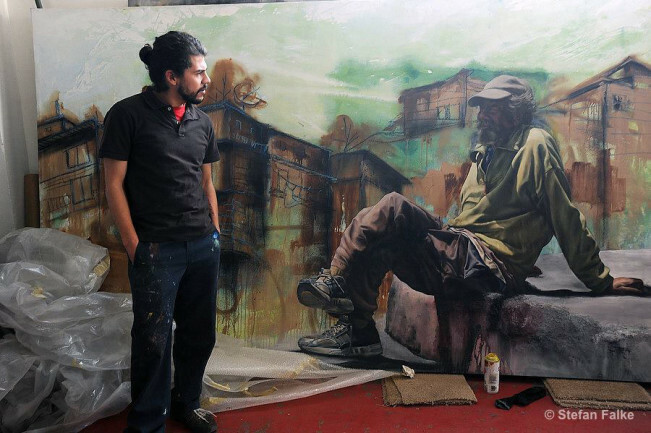 Alfredo Libre Gutierrez at his studio in Tijuana in 2009. Back then the painter and muralist portrayed the homeless (some of them American) in Tjuana in a series called Vagabundos. 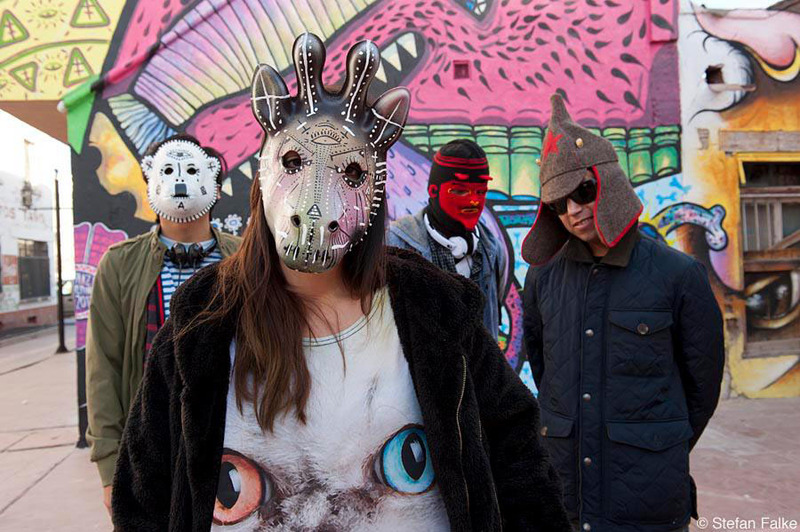 Libre Guiterrez is a crew member of the Tijuana based artist group Hem. Jean Von Borstel, artist in Playas Tijuana, with her iron and wood sculpture in Playas Tijuana, Mexico. Azzul Monraz, front woman of Madame Ur y su Hombres, in Tijuana, March 2012. Stefan Falke’s photography can be found at Border Artists. You can also order prints for his fundraisers. In order to continue the project this year, he’s offering a Limited Edition Portfolio Box (limited to 15 only) especially to museums, art institutions and collectors.